*Bulk purchase rates available. Please contact us for details. 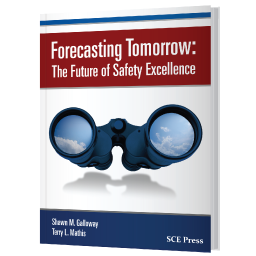 Based on the book, Forecasting Tomorrow: The Future of Safety Excellence, this workshop is centered on the seven most pervasive predictions for the future. Each prediction will be explored along with its implications for future safety efforts. Case studies will be presented outlining what leading organizations are already doing and planning to address these issues. It is recommended that each attendee read the book prior to attending. The future of safety excellence is not going to be a slow or steady evolution. Big changes are on the horizon, and new thinking and methodologies will literally revolutionize future safety efforts in leading organizations. Those who adapt slowly will be left behind and regularly ambushed with radical changes that could compromise safety efforts or waste valuable resources on outdated programs. A glimpse into the future can make the journey to tomorrow a much safer trip. Access to Shawn M. Galloway or Terry L. Mathis from 8am to 5pm CT during the week by email and/or phone for one month following the workshop to help support the sharing and communicating of your plan to address the future. If not immediately accessible, calls and emails will be returned within 24 hours. A personalized autographed copy of the book, Forecasting Tomorrow: The Future of Safety Excellence. Note: This workshop is also available as a private event for members of your organization, those not able to attend public workshops, or those requiring additional customization of workshop materials.